Grace Tempany | ‘What would a wise person do?’: On counteracting the Cartesian emphasis in our schools. ‘What would a wise person do?’: On counteracting the Cartesian emphasis in our schools. When I was living in New Zealand a few years ago I discovered the School of Philosophy. I was teaching yoga in Auckland and asked my studio owner specifically not to schedule me on Tuesday nights so I could attend the weekly sessions. The introductory course was ‘Practical Philosophy, Spirituality and Mindfulness’, and I loved it all. It was around this time I started to get acqainted with the ancient Eastern and Western texts which put words to what I had experienced, but was not quite able to verbalise. I continued on to complete courses 2 (Happiness) and 3 (Love) and when I moved down to the south island I couldn’t resist seeking out the local School of Philosophy in Christchurch. There I discovered a very small group of practitioners who were three weeks into course 8 and had been meditating for at least a year and a half. There was no other class for me to join so in I went. At that stage my own meditation practice was largely non-existent but I was on the way to establishing one, and there’s really nothing like being surrounded by perceived ‘pros’ to eliminate all procrastinative tendencies! One of the very first things I heard at the School of Philosophy was ‘You cannot be that which you observe’, and it has honestly stayed with me ever since. I remind yoga students when they are getting caught up in a particularly challenging yin pose. I say it sometimes in school when a student is in distress. I used it as an introduction to a meditation class I taught on Saturday. And I more than often need to remind myself of it. The truth is we are so much more than our thoughts, feelings, and emotions, and only when we practise ‘observing’ them can we reach a greater realisation of the part of us that is doing the observing. In this knowledge-obsessed world we live in where wisdom is all too rare, I reckon we need to acknowledge where Descartes fell short. God knows I sang from the Cartesian hymnsheet (“I think, therefore I am”) for long enough, but if we do not temper our appreciation of ‘thinking’ with an awareness of when ‘thinking’ is entirely insufficient – and sometimes detrimental, then we are doing both ourselves and our students a great disservice. When I think of the teenagers I teach daily and consider what causes them most stress and anxiety (aside from the general academic pressures) it nearly always comes down to the stories in their head, the things they tell themselves, the thoughts they believe and become attached to, their minds that they feel are just so ‘full’. Well, the dog gets it! Ken Robinson more recently speaks of the two worlds we all live in; World 1 is the one which existed before we came into it and will be there once we’re gone – the world of ‘objects, events, and other people; the world around us’. But World 2 is the world which exists only because we exist: it’s the private world of your own thoughts and feelings, it’s the world inside of you. "What people contribute to the world around them has everything to do with how they engage with the world within them". And we all know which of these worlds is bigger. Traditionally schools have done a pretty good job of preparing many of us for World 1, but there is a general understanding that the conventional academic curriculum is massively biased in terms of its focus on the world around us as opposed to the world within us. Fortunately, with both the increasing focus on student wellbeing and the realisation that it’s with their inner world that students require the most navigational support, World 2 is now becoming equally integral. There are many positive developments to note; Mindfulness in schools is gathering momentum. The introduction of Philosophy as an optional short course at Junior Cycle is clearly a move, albeit a tiny one, away from the habitual rote-learning patterns. 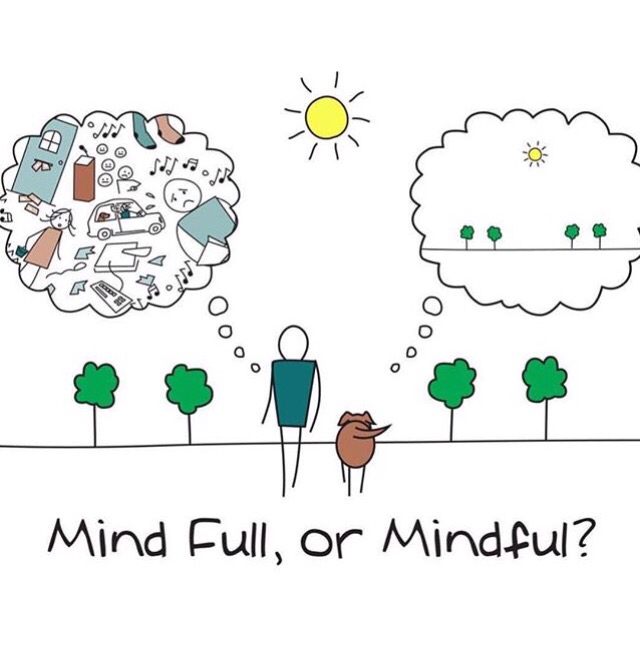 Many schools are adopting whole-school/staff Mindfulness initiatives. I even know of primary schools where the students start in 1st Class, at 6 years old! There are so many ways in which yoga can be of benefit in schools, and I have no intention of making yet another list when there are thousands available online. But I will say that the majority of us who so regularly expound the benefits of this ancient lineage probably weren’t lucky enough to discover it in school. And if the current worrying trends that we observe - increasing rates of human disconnection, depression linked to excessive social media exposure, bullying, anxiety, and suicide - are an indication that looking after our young peoples’ mental health needs to be top of our priority list, then it would only seem logical that yoga and meditation occupy their appropriate place. This week (or at least what Ophelia leaves of it!) is our ‘Minding My Mind’ Week in Mount Anville and I’m bringing yoga to those who want to participate. It was on my own mat that I first came to an understanding of what true compassion meant, and where I finally understood how imperative it was that I include myself in its range. It possibly is the most important value that we need to cultivate in ourselves and inspire in others. So when I lead these classes I’ll hold a safe space for all students to learn how to relax. I hope to help some realise that they can nurture their own wellbeing, and I may just might support a few to come to greater self-knowledge, tap into their own inner wisdom, and cultivate compassion for themselves and others. The above may be a tall order for a few yoga classes but it’s a differentiated plan, and “for the sake of one child” it's worth it. “Life is made up of a collection of moments that are not ours to keep. And the above words by Rachel Brathen are my new hymnsheet!